The sub-$100 micro ATX case is now available. The newest member of Cooler Master's modular MasterCase series, the MasterCase Pro 3, is now available to purchase for less than $100. You can think of the MasterCase Pro 3 as a smaller version of the MasterCase 5, albeit with a slightly different aesthetic. 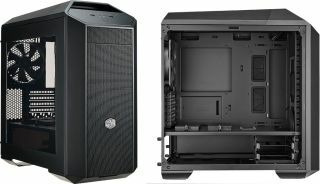 Cooler Master's aim with the MasterCase 3 was to give builders the same level of customization as its bigger sibling, but in a smaller package for micro-ATX systems. "Based on our community research, we found that micro-ATX motherboards are becoming increasingly popular. People using micro-ATX motherboards also want a smaller case much of the time. Therefore, we decided to make the MasterCase Pro 3 smaller than the MasterCase 5 series," said Mark, Product Marketing lead for cases. "Being part of our MasterCase series, the Pro 3 is also modular thanks to our FreeForm system, allowing users to customize, adjust, and upgrade their case the way they want." Though it's a smaller chassis for micro-ATX builds, the MasterCase Pro 3 can handle larger size components, such as long power supplies up to 200mm in length, tall CPU coolers up to 190mm in height, and graphics cards up to 370mm in length with the 3.5-inch HDD cage removed or up to 258mm in length with it intact. Front panel connectivity consists of two USB 3.0 ports and HD audio ports. You can stuff a pair of 3.5-inch drives in this thing or up to four 2.5-inch SSDs. It also features five fan slots (and comes with a front and rear 140mm fans), which you can swap out for a radiator or two to liquid cool your system. If going that route, you can mount a 120mm or 140mm radiator in the rear and a 120mm, 140mm, or 240mm radiator up top. Like other MasterCase enclosures, this one is modular with swappable and removable parts. It's also compatible with a special line of accessories, including glass side panels, LED partitions, top and front dust overs, graphics card supports, and so forth. The MasterCase Pro 3 is available now on Amazon for $98, with an MSRP of £90 in the UK.